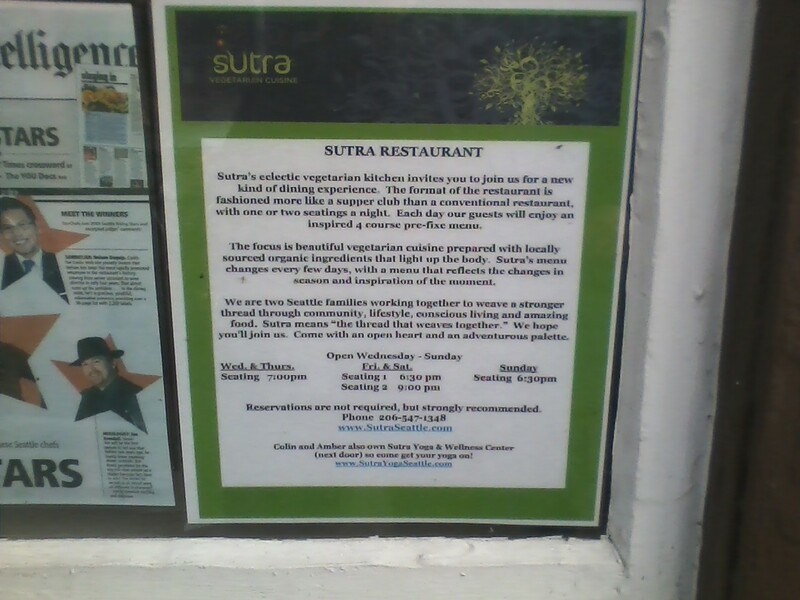 In my previous post about our short trip to Seattle for some much needed R&R (with no plans except to hang out with our younger son and daughter-in-law - and sometimes with their turtle, too), I mentioned we ate at a small restaurant named Sutra, featuring vegetarian recipes using locally grown organic food, served in a community style. 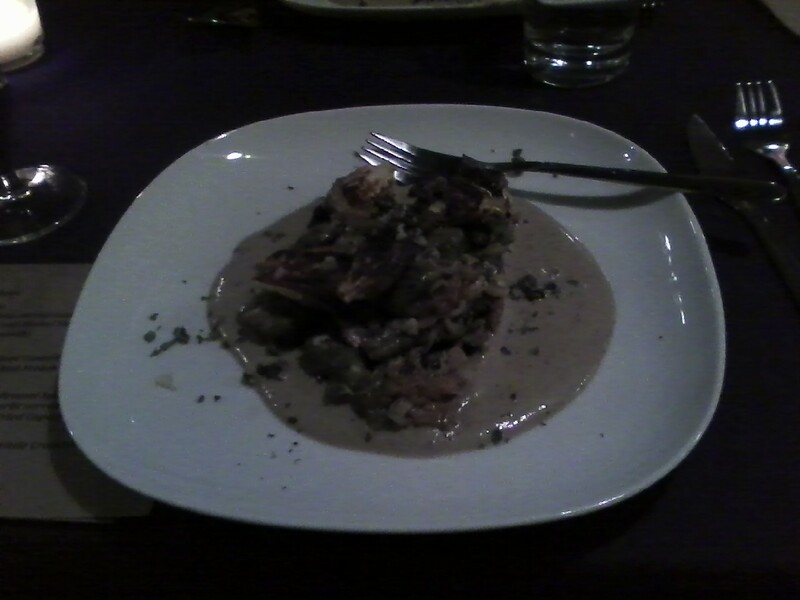 Scrumptious is not really a word that fully covers the experience. Perhaps adding sublime enlarges the feeling of eating food so lovingly grown, prepared, and served by a host of hands and hearts, from field to fork. 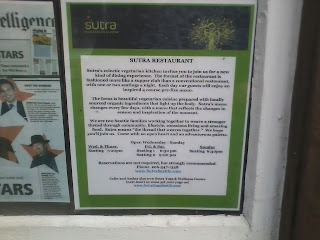 The photo below is too small to read the line I wanted to remember, which says Sutra means 'the thread that weaves together'. A large complex tapestry was my favorite visual image when under-going chemotherapy in 1995, envisioning each part of my life, how I was connected to large and small parts of the image, how each friend or family member was weaving their own small part or thread together to make the whole hold together. I could not have made it through that third cancer without each thread. No course (including paired Washington wines) was rushed, the evening was casual, the course sizes were all just right, no one left feeling hungry or 'stuffed' (although I confess to loving the feeling of being full and satisfied), and everyone had a favorite component to the meal. 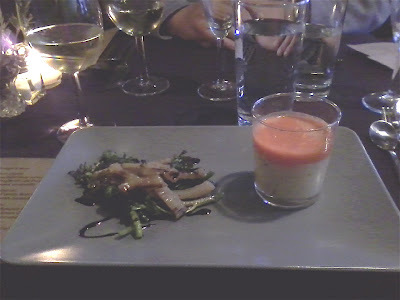 I loved the soup best, which was served in a clear small tumbler type of bowl, so one could truly see the orange carrot soup layered on top of the whitish leek-parsnip-tarragon soup, i.e. colors and flavors were separated, at least until the spoon first entered the bowl. Here is another confession. The soup was SO good, and that 'bowl' being shaped like a small glass found me actually taking the 'bowl' to my mouth and skipping the spoon altogether for my second taste. Of course I immediately realized what 'poor form' that was as soon as I did it and employed the spoon again after a good laugh, but the point is, the appearance and flavors of this soup, initially separated but then mingled, were a knock-out winner. 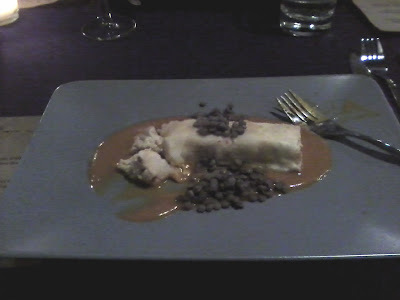 All this food is much fancier than any recipe included on my website or blogs. We eat much simpler food than this and don't go out to eat much at home anymore for a variety of reasons, so this experience was a real treat to see what creative chefs can do with a wide variety of local, seasonal ingredients. It is likely that some of them (like the parsnips, cauliflower, Brussels sprouts) were last Fall's cool weather crops still in good storage conditions, but the nettles and green garlic were definitely harvested very recently. 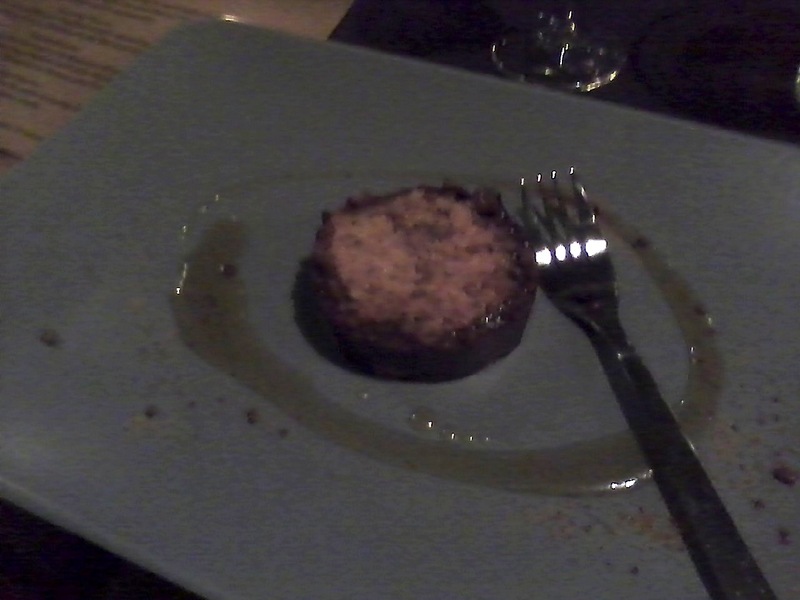 A delicious and delightful post. I probably enjoyed reading it nearly as much as you savored this amazing meal. And I do love your description of falling in love with the soup :-).